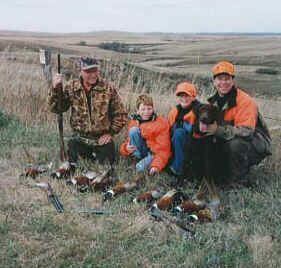 age 2, pheasant hunting in North Dakota. Dakota is owned by Loren and Micki Holub, Scottsbluff, NB. (L to R) Cal Webster, Jimmy Holub, Ryan Clay, Dakota, and Loren Holub.